2 Bedroom Fountain & Burj Khalifa View!. Downtown Dubai is one the most sought after areas in rent for property rentals. It is particularly popular with singles and young couples but also offers plenty of amenities for families. Downtown Dubai is the metropolitan city center of modern Dubai. The Burj Khalifa tower, the Dubai Mall, Dubai Dancing Water Fountains and Dubai Opera are amongst the center pieces of the community. A beautiful serene sub-community of the Old Town, a low-rise set of medieval Arabic styled buildings, offers a beautiful and quiet contrast to the modern skyrise center. The community offers endless dining options from casual dining to Michelin starred chef fine dining. The cuisine of all types is available and abundant. The Dubai Mall and surrounding boutique shops provide perhaps the greatest array of shopping in the world. The connectivity to the rest of the Dubai is excellent. Easy connections to the major highways and in particular Sheikh Zayed Road, as well as metro connectivity and internal tram network, are major pluses. Renting a property in Downtown Dubai is particularly popular with those working in Downtown Dubai and nearby areas of DIFC (financial centre), Business Bay and Deira. Being a city center community, most properties available are in the form of apartments. Some podium villas in high rise towers are also available that offer a patio or garden. Apartments range from studios to large penthouses. Apartments here tend to be slightly smaller in general compared to many other communities in Dubai. 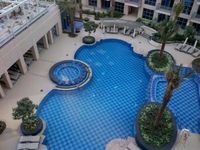 Buildings are of a high standard and offer many high standard amenities such as swimming pools, gyms, spas, play areas etc. There are many spectacular city views to be had however views of the Burj Khalifa, Water Fountains or sea views command higher prices. Serviced apartments are also more commonly available here and they provide basic cleaning and upkeep included in the rent. 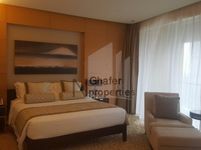 Hotel apartments in hotels such as the Address hotels can be also be rented with a greater range of services but are pricier. Prices, amenities, and sizes vary according to the exact location, amenities, and views. It is highly recommended that a few different types of properties for rent in Downtown Dubai be seen before deciding on the final property. In conclusion, Downtown Dubai is a wonderful community for those looking for a busier and social lifestyle with a preference for the city center amenities - providing they have an adequate budget. Larger Dubai properties are available for families but can be expensive as they are often rented by executive level employees of multinational firms in nearby areas. There is plenty of to see and do and the wide well maintained pavements provide nice walking areas through the community. All in all, a very nice place to live with endless amenities for those with a good budget.